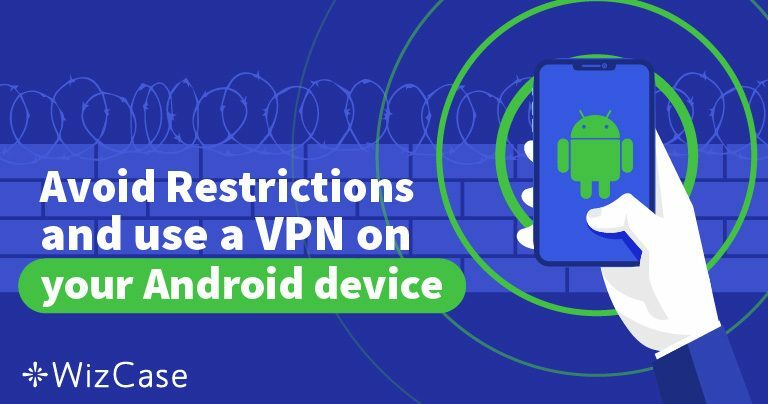 Considering that Android is one of the world’s largest smartphone providers, it’s surprising that not many of it’s users have thought about protecting their smartphone with a VPN. While many are forward thinking enough to download antivirus software to protect their phones, they often overlook the importance of protecting their privacy when browsing online. A good VPN will keep you protected and safe, especially when using unsecured, public Wi-Fi networks. A VPN won’t only provide you with privacy and security but it can be great for bypassing geoblocks and gaining access to content in other countries, which lets you stream movies and shows from anywhere in the world by changing your IP address. Having an app added to the Google Play store isn’t that difficult, which leads to a lot of apps from questionable sources being downloaded. We took a look at the top organic results when we searched “VPN” and found major issues with them. Most of the apps include ads, which means that they are selling your data to third party marketers, some are owned by Chinese firms, while others just didn’t do a good job of protecting user privacy; they were plagued with IP and DNS Leaks. The 5 VPNs listed below did very well in our testing process, and they will protect your privacy, bypass geo blocks, and more. NordVPN is a user favorite for its cheap subscription fees , fast speeds, great security, and concern for privacy. In all categories, NordVPN often comes out as one of the best. 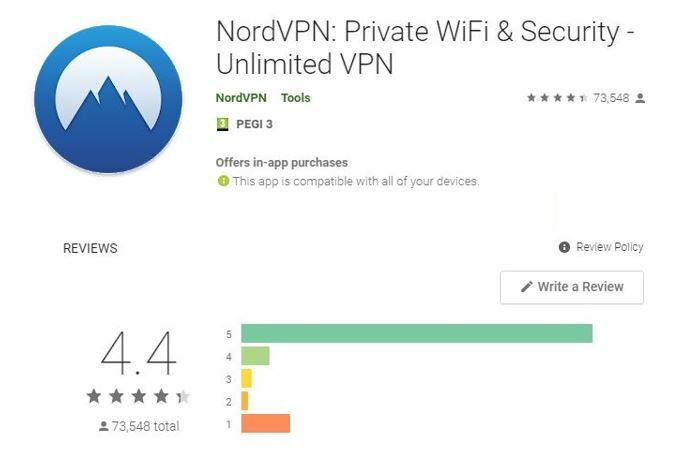 With millions of downloads and such a high user rating, NordVPN easily instills confidence before it’s even downloaded. One of its biggest strengths is the Double VPN feature, which allows you to pass your connection through two separate VPNs, providing you with an added layer of security. It also has a strict no logs policy and is based outside of the 5/9/14 Eyes Alliance, so you never need to worry about your information being passed onto the wrong people. NordVPN clearly has a strong focus on your privacy and security, but that doesn’t mean it lacks in other areas. In fact NordVPN has some of the fastest speeds out there and we found little difference in comparison with our normal servers. The app also provides an adblocker so you can have more freedom online while using less data. Paired with its impressive repertoire of over 5000 servers in 62 countries, NordVPN is one of the best options out there when it comes to an Android VPN. CyberGhost has everything you’d expect from a top tier Android VPN. It has one of the highest user ratings on the Google Play store which is no surprise as it recommends the fastest servers available to you, allows you to save your favorite servers, and has an easy to use kill switch. One thing to note with CyberGhost is that the speeds are slightly slower than that of NordVPN or ExpressVPN. However this shouldn’t be a massive problem for most, as you’ll still have considerable download speeds compared to other services. With CyberGhost you’ll gain instant and effortless VPN protection with the option of over 3000 servers in over 60 countries so you can connect to everything you love with complete anonymity. Their 24/7 friendly support will put you in touch with real human beings if you ever encounter any trouble with their service. They also allow you to connect up to seven devices simultaneously meaning it’s highly unlikely you’ll ever have a device that isn’t protected. 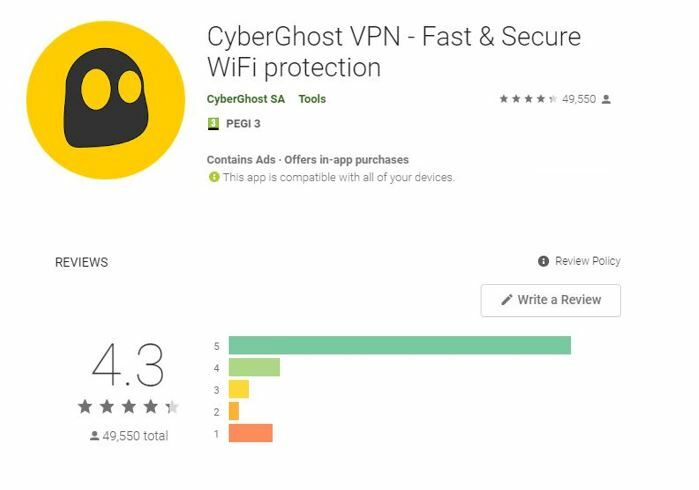 Overall, CyberGhost is a great option for those looking for an Android VPN which performs well and will keep you protected with industry standards such as OpenVPN, 256-bit AES encryption, and DNS and IP leak protection. Their 45-day money back guarantee is also a brilliant factor for those needing a little extra reassurance before they commit. ExpressVPN is one of the top VPNs available on today’s market. They are well known for their outstanding speeds and high level of security. You can be confident that with ExpressVPN you’ll be receiving some of the best services money can buy. In saying that, you will be paying more for Express VPN as its price tag is expensive compared to other VPNs out there. However, we believe it’s worth your while as you do gain access to one of the most advanced providers with top notch features. These features include some of the fastest speeds we’ve seen on an Android VPN and it’s a well know fact through the VPN community that ExpressVPN always comes out on top in this category. You can rest assured that you’ll never be left vulnerable with ExpressVPN as their security features include AES 256-bit encryption and have OpenVPN as their default protocol. ExpressVPN vows to encrypt your Wi-Fi connections, particularly in public spaces, so snoopers can’t collect your personal information. ExpressVPN has 148 mobile servers in 94 countries and allows you to set your favorite servers so they are always within easy reach. Their smart location feature will also automatically connect you to the server that will provide you with the best experience depending on your location. With unlimited bandwidth and around the clock support with their live chat feature we think it’s definitely worth giving a go. Even if you’re not sure, they offer a 30 day money back guarantee on all of their packages, so the choice can be 100% stress free. SurfShark offers an excellent Android software to keep you protected at all times. Their dedicated app provides you with various protocols designed to protect your privacy such as OpenVPN, L2TP/IPsec, PPTP and CleanWeb, which is SurfShark’s own custom ad and malware blocker. This VPN also has great download speeds so you’ll have no need to worry about buffering when streaming on networks such as Amazon Prime, Netflix, Youtube, Hulu or more via your device. 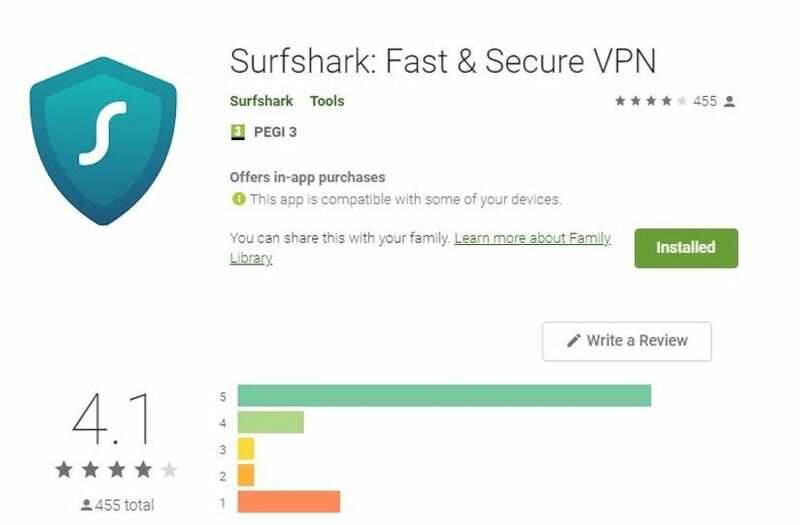 You also have an unlimited number of simultaneous connections with SurfShark, so not only will you be able to connect to your Android, but your computer and all your families devices can stay protected as well. You can see with some VPNs that their app for Android was more of an afterthought, yet that isn’t the case with SurfShark. Their dedicated app still holds many of the great features available on the desktop version. They care about your privacy and you’ll undoubtedly feel protected with their endless security features, which include a kill switch, MultiHop, DNS options, and 256-bit AES encryption protocol. SurfShark even had a private cybersecurity company, Cure53, audit their services and the results were outstanding, with Cure53 being highly satisfied with the level of security and encryption offered by this VPN. When looking for an Android VPN, the app has to be one the most important factors. TunnelBear doesn’t disappoint in this aspect. You may wonder why we rate them 5th despite having the most downloads and the highest rating of the 5 apps we’ve reviews. The reason is simple, a majority of the reviews were written by the free users, which lets us know that it’s a great free Android VPN. But when compared to the other premium providers listed above, we felt it deserved the 5th spot. The app is fantastic and full of cute graphics and little bears, making it really fun to use. The interface is easy to understand and interact with, which is just one of the reasons it has amazing ratings on the Google Play store. TunnelBear even has a customized Android widget, allowing you to choose a country or connect with just a tap right from your homepage. A convenient feature that not many other VPNs have implemented. With TunnelBear you’ll be protected with superior 256-bit encryption and a zero logs policy. They also have relatively fast speeds and allow you to connect up to five devices at once. Having the ability to connect multiple devices to the VPN is a great feature for any families or tech-savvy couples out there. 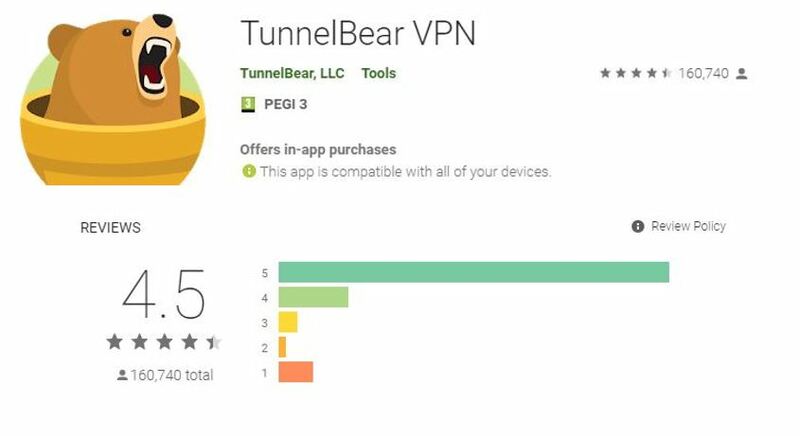 TunnelBear is one of the only premium VPNs that offer a free plan. If you decide to play around on the free version before you buy, then you will be limited to 500MB, yet we think this is more than enough to decide if it’s the right VPN for you. VPNs aren’t just vital for your laptop or desktop computer, but also your mobile phone as they inevitably hold a lot of your sensitive and hackable data.You’re often using your phone for a major part of the day, so of course it’s going to contain a lot of important and personal information. Here a few of the biggest reasons you need to a VPN on your Android device. Working remotely – These days it’s becoming more common for people to work remotely whether that’s at home, in a cafe, or on the other side of the world. If you’re ever working remotely and need to access confidential company files, using a VPN is the best way to do this securely and ensure that no prying eyes are viewing sensitive information. Nobody wants their company data accidentally finding its way into the wrong hands through a leak in your connection. Connecting to public WiFi – Many people are still unaware of the dangers involved with connecting to public WiFi and are blind to the lack of security they provide. Each time you connect to a public network you’ll leaving your data vulnerable to hackers and cybercriminals. By using a VPN, you get to outsmart the criminals and stay hidden and protected from any prying eyes. Unlock restricted content – If you’re traveling, you may have discovered that it isn’t as easy to access the websites you love and normally use at home. That’s due to the geo-restrictions used by countries all over the globe to block content they deem inappropriate. Netflix and other streaming sites are the biggest culprits when it comes to geo-blocking, as they have to comply with the copyright laws put in place by movie and TV studios. If you want to get around these restrictions and watch your favorite programs, all you need to do is download a quality VPN and you’ll gain free reign of the internet once more. Protect yourself from online attacks – Ransomware attacks are unfortunately becoming more frequent on mobile devices with hackers locking people out of their phones and demanding a ransom for it to be unlocked. The last thing you want is to be targeted for one of these attacks and the best way to protect yourself is to ultimately stay off hackers’ and cybercriminals’ radars. A VPN will keep you completely hidden and anonymous from these malicious figures, which leaves you to use your phone in peace. 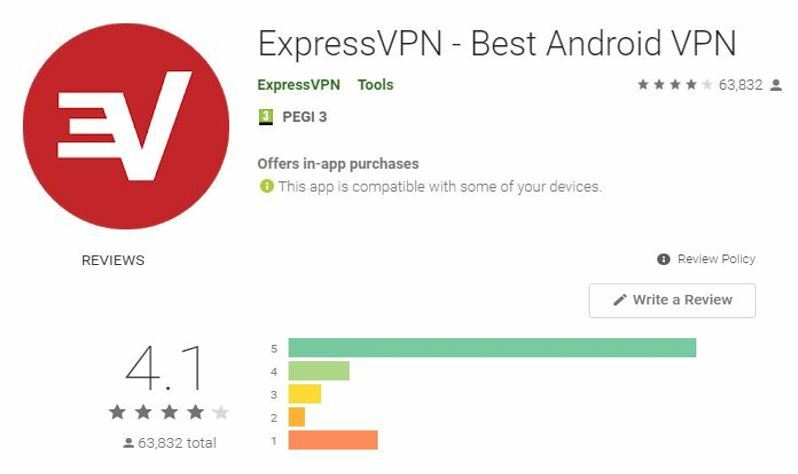 The Google Play rating is always a good place to start verifying the quality of any application you want to download onto your mobile device, but it shouldn’t be the only research you do when hunting for a VPN service. We have done an intensive review of each of the VPN services above, combing through every aspect of these providers before ranking them. At Wizcase, we look at several important factors in particular from the speed of the servers, the number of servers available, the interface and usability of the Android apps, the security and encryption features offered for mobile devices, and their reliability, just to name a few. We’ve occasionally found services to be undeserving of their Google Play ratings when reviewing VPNs with our criteria, and we would encourage you to also do some extended research before making your choice. By all means, download each of the above VPNs and take advantage of their free trials and money-back guarantees so you can try them out for yourself and see their quality. A VPN won’t only provide you with privacy and security but it can be great for bypassing geo blocks and gaining access to content in other countries, which lets you stream movies and shows from anywhere in the world by changing your IP address. The main reasons you need an Android VPN is to hide your IP address so you can stay anonymous, bypass geo restrictions in order to watch your favorite shows on Netflix or Hulu, keep your personal data safe and secure, and protect yourself from hackers and prying eyes while online. However when choosing the best VPN for you, there will be a whole other list of questions and features you should be considering. How many devices do you want to connect? What’s your main purpose for wanting a VPN? How do you spend the majority of your time online? We suggest answering some of these questions before picking out a VPN so that you don’t end up with one that doesn’t fulfill your needs. Depending on these answers you’ll want to focus on some of the following aspects when making your decision. Quality VPNs will be able to closely maintain your regular speeds and won’t cause any buffering or slow your download speeds when watching YouTube or Netflix. They also have several layered security features to ensure that your data won’t leak. They should take pride in the care of your personal information and should have a strong focus on protecting your anonymity, especially when you’re connected to public Wi-Fi networks as this will be when your device is most vulnerable. You should pay close attention to the number of servers they provide and how many countries these servers are located in, as this will not only affect the speed of the VPN but also give you more access to geo-blocked content. Finally, take a look at their policies and if they allow you a free trial or money back guarantee, that way you don’t have to take anyone’s word for how good the provider is, but rather you can test it out for yourself. While there are a wide variety of VPN providers out there, it is best to go with a company that has proven themselves over many years. All of the above VPNs will keep you safe from hackers on public Wi-Fi networks while offering decent safety features at a reasonable price. One thing to keep in mind if you decide to go with a free VPN, is that it’s not going to have the fastest speeds, the best security, and the easiest platform to use. Some also have limitations on servers or bandwidth, while others only allow you to use one device at a time. We understand that while you’re looking for a VPN for your Android devices, you might be tempted to opt for some of the free services out there. We strongly recommend against these free VPNs as they have a high chance of leaving you worse off. You need to be careful of free VPN providers as, in our experience, only premium quality VPNs will ensure that your IP address, data, and personal information aren’t compromised. Free VPNs, on the other hand, often fail to provide the most basic services expected of a VPN, entirely defeating their purpose. Many free VPNs make their money by selling your information to third parties, advertising companies and government agencies. If you are truly concerned about your privacy and security then a free VPN is has a high probability of letting you down. A free VPN can actually do a substantial amount of harm to you as well. It can infect your device with dangerous malware, improperly encrypt your data, sell your personal information to third parties, and send many advertisements to your device. If you’re Android VPN can’t complete the basic tasks of a VPN and shows any signs of causing you harm then we highly recommend you start searching elsewhere. If you don’t mind spending a couple of extra dollars, we highly recommend using NordVPN , it’s by far our top pick with the value you’ll receive for your money. But any of the other options on this list will serve you well and extend far beyond the basic services you’d expect.